Uma Sapna blends privacy and comfort with art. Culture and design for a unique holiday experience in a place to soothe the senses mind, body and soul. self-contained villas are perfect for honeymooners or for the discerning traveler seeking an escape,just the way they like it. 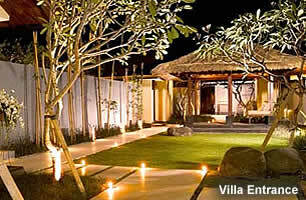 One-bedroom Uma Sapna Villas cluster around the main pool. 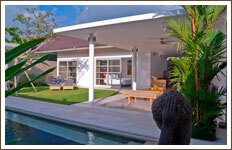 Outdoor open-air, private plunge pools are surrounded by nature. The bedroom is king-bedded with a desk entertainment center mini bar and refrigerator. An en suite soak tub overlooks the garden with separate dual vanities shower and toilet. 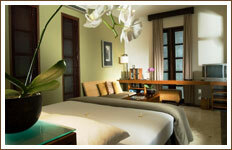 The spacious outdoor lounge and dinning area features a private plunge pool set with jacuzzi in lush tropical gardens. One-bedroom Uma Sapna Suite Villas are encompassed in their own private, wailed compound The bedroom is a king-bedded with a spacious lounge area with a sofa and desk entertainment center, mini bar and refrigerator. An en suite soak overlooks the garden. with separate dual vanities, shower and toilet. 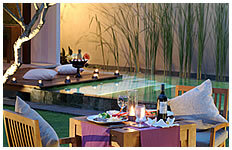 The spacious outdoor lounge and dinning area features a swimming pool in lush tropical gardens. 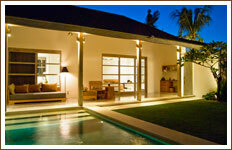 One-bedroom Uma Sapna Suite Villas are encompassede in their own private walled compound with water gardens. One bedroom is king-bedded, teh second is twin badded. each with a desk entertainment center, mini bar and refrigerator. Each en suite soak tub overlooks the garden with separate dual vanities shower and toilet. A fully equipped kitchen is available for in-villa dining complete with an on call chef. The spacious outdoor lounge and dinning area features a swimming pool in expansive. lush tropical gardens. Special events can be arranged accordingly to guest's requests, such as romantic dinner, traditional Balinese cultural dance performances, in-villa spa treatment and other activities.